In the first two articles in this series, you built a REST API using StrongLoop LoopBack and several AngularJS directives that use your API via the LoopBack AngularJS SDK. With these two components, you’ve done most of the work of building a hybrid mobile app using the Ionic framework. The Ionic framework is based on AngularJS, and, thanks to AngularJS’ flexibility, you’ll be able to use the `timer` and `timeList` directives in your mobile app without any changes. Loading templates from the server makes sense for desktop browser apps, but it’s a terrible choice for mobile. Luckily, our mobile app will be packaged up so the HTML file will be served locally. That said, it still has to do an Ajax call and read the file from device storage. In order to avoid making an HTTP request for a template, AngularJS developers usually leverage the template cache. If you want to learn about the template cache in more detail, check out Chapter 6 of Professional AngularJS. For the purposes of this article series, you only need to know that AngularJS won’t make an HTTP request for the template if you pre-populate the template cache. That is, if you set a value for templates/timer.html in the cache as shown below, AngularJS will use the cached value. // This rename option lets you transform the first argument to `put()`. 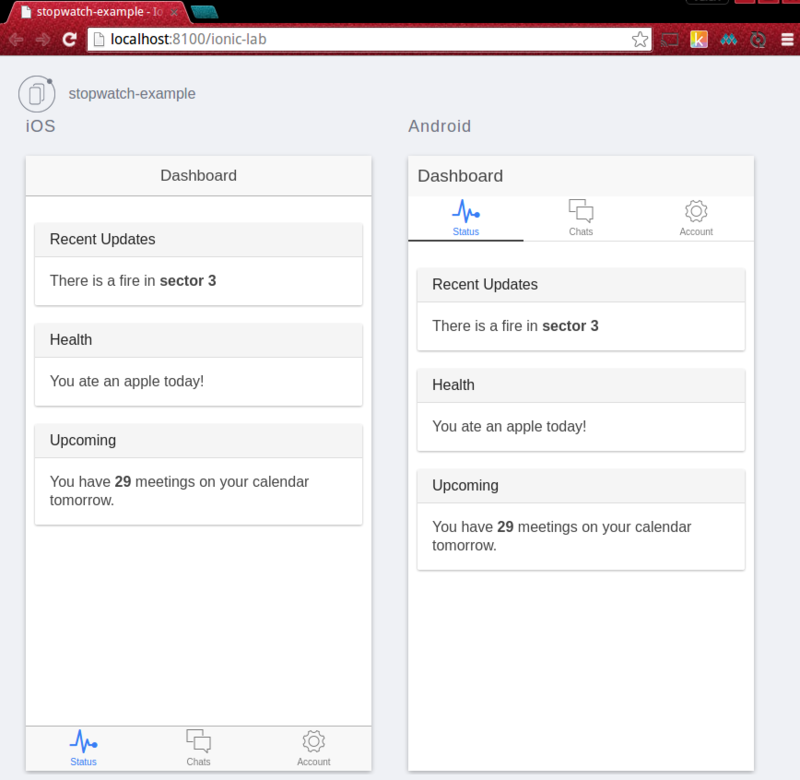 Getting started with Ionic is pretty easy. First, you need to npm install -g cordova ionic. Once you’ve installed Ionic, you should be able to create a new Ionic app in the current directory using Ionic’s handy CLI. 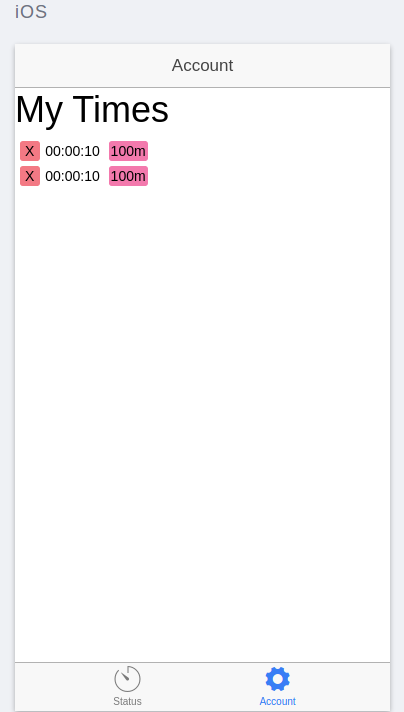 For instance, you can create a new app called ‘stopwatch-example’ using the ‘tabs’ app template using ionic start stopwatch-example tabs. You can also just do git checkout step-2 in the ‘stopwatch-example’ GitHub repo to get the starter app. 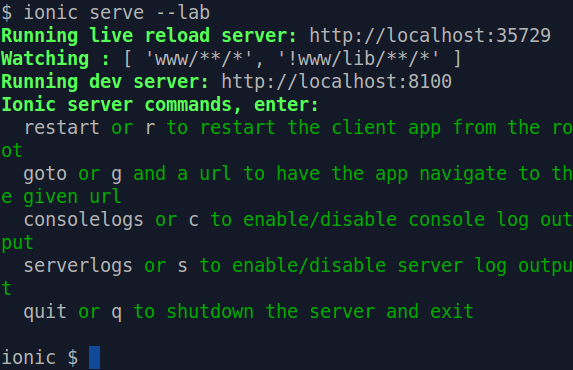 Once you have the starter app, run ionic serve --lab. This will start Ionic’s powerful CLI and launch a browser that has a side-by-side view of how your app will look on iOS and on Android. The CLI should look like the below picture. The browser should look like the below picture. 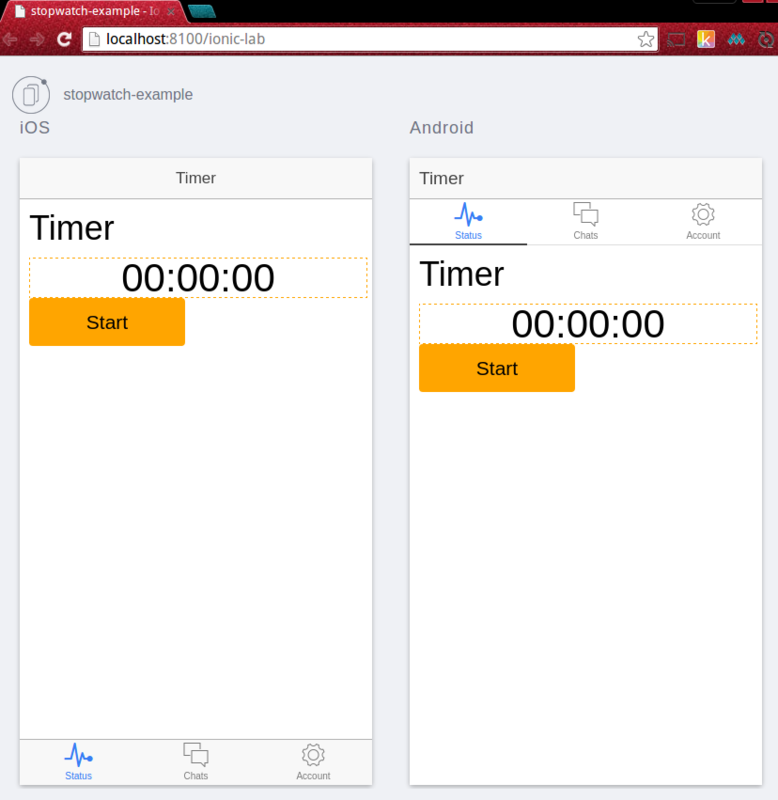 In this step, you’ll take the Ionic tabs starter app and make it display the timer directive. This will give you a functioning stopwatch app, minus the ability to make HTTP requests to the server. Once you run bower install, bower will install ngResource and momentJS alongside your directives and templates. You can set the install path in your .bowerrc file, so bower installs into a directory your Ionic app can access. The www directory is the root directory for your Ionic app. You might have noticed that it has an index.html file – this is the root HTML file for your Ionic app. Now that you’ve installed your dependencies, add the below script tags to index.html to include ngResource, moment, and your stopwatch directives. Your Ionic app also has a main AngularJS module, defined in www/js/app.js. Add the ‘core’ (from directives/index.js) and ‘templates’ (from templates/index.js) modules to the starter module’s list of dependencies. Now that you’ve properly included your AngularJS modules, you should be able to include the timer directive in your app’s dashboard tab as shown in this GitHub diff. 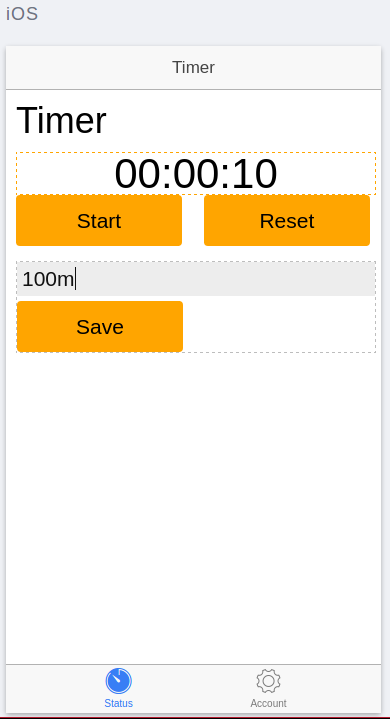 You should then see your timer directive in your ionic serve --lab window as shown below. The directive saves by making an HTTP request to `/api/Times` rather than `http://localhost:3000/api/Times`, which is where your REST API is. You haven’t logged in with Facebook, and so you aren’t authorized. Thankfully, fixing these two problems is simple. The first problem can be solved with an AngularJS HTTP interceptor. Interceptors enable you to transform every HTTP request your application makes. In particular, the below request interceptor converts every request to /api/Times into a cross-origin request to http://localhost:3000/api/Times. The above interceptor also does one more important task. Notice the [with Credentials property](https://docs.angularjs.org/api/ng/service/$http#usage)? That tells AngularJS to send cookies on cross-origin requests. Because of browser security restrictions, AngularJS doesn’t send cookies on cross-origin requests by default. 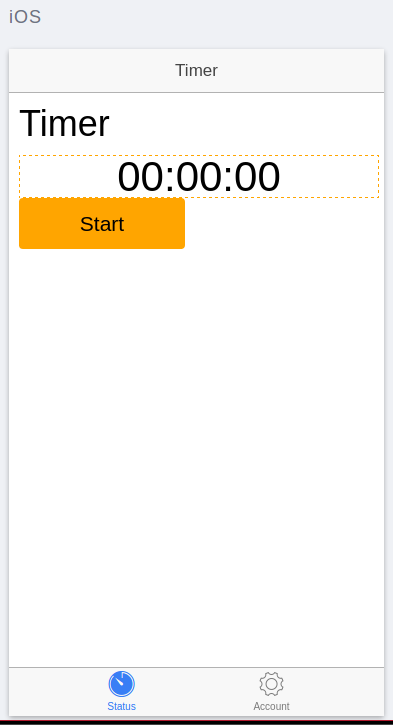 The second problem can be solved with a Cordova plugin called inappbrowser. You won’t need this plugin in your ionic serve --lab workflow, but Cordova by itself doesn’t have good support for popup windows. Adding this plugin requires adding a line to your package.json . However, window.open() in regular browsers has numerous cumbersome security restrictions. Thankfully, this only affects the login flow in ionic serve --lab, so you can wait for the user to close the popup window before reloading. In a real app, you can register a listener to the ‘loadstop’ event that the inappbrowser plugin broadcasts when the window’s URL changes. You can take a look at the $facebookLogin service that encapsulates this logic here. Once you’ve configured the HTTP interceptor and added Facebook login, your timer and timeList directives should work as written. You can start your timer, save it, and then see your timer results in the ‘account’ tab. Congratulations! You just took your AngularJS directives and packaged them into an Ionic framework app by adding a build step and making a couple configuration changes. With ionic serve lab, you can work further on your mobile app without any bloated IDEs or SDKs. Note that you’ll still need the proper Android/iOS SDK to compile your app for the app store using ionic build. In the next article in this series, you’ll learn about another key advantage of hybrid mobile apps with Ionic: leveraging AngularJS’ powerful testing modules to write integration tests for your app.